Paperless drywall is justifiably hyped as virtually mold-proof, but also widely maligned for several drawbacks. Cost is the biggest issue. Paperless drywall is pricier than traditional paper-faced alternatives. This immediately rules out paperless drywall for many homeowners, but it shouldn't. In the long run, it can be a money saver and even a lifesaver. I spent several months outside New Orleans working for the St. Bernard Project and rebuilding homes destroyed by Hurricane Katrina. I saw plenty of mold in that time -- in gutted homes as well as those flooded during reconstruction. It also appeared on both white and green drywall. The green boards are paper-faced gypsum board treated with mold-resistant material; they are clearly not mold-proof, however, as I witnessed. Granted, conditions were not normal, but they certainly brought home the fact that mold-resistant "greenboard" still has plenty of tasty paper for mold to eat. It's just masked with chemicals to repel the mold. By contrast, paperless drywall has fiberglass facing on the gypsum sheets. It also is not guaranteed to be 100-percent mold-proof, but at least eliminates a major potential food source for mold spores. Fiberglass is a skin and lung irritant. The fiberglass dust raised by cutting paperless drywall can be more irritating than standard drywall dust. Some people suggest this makes it as dangerous as the mold it aims to prevent. However, fiberglass irritation is not a long-term health hazard, just a temporary nuisance. Moreover, it can easily be avoided with simple safety gear: long sleeves, masks, glasses and gloves. Paperless drywall also costs more. It can be hard to find, and you should expect to pay about $1 more per sheet for paperless drywall than mold-resistant "greenboard." Moreover, some users complain that the lack of paper facing further drives up installation costs. Paperless drywall may be harder to attach to the wall because screws are more likely to drive too far into the drywall. These deepset screws don't hold up the drywall, allowing more pieces to break and requiring more screws. On the other hand, in addition to its mold resistance, paperless drywall is generally sturdier and less likely to warp, dent and tear. Therefore, it may last longer, and you'll need to replace fewer defective boards. Paperless drywall is trickier to finish. This one may come as a surprise to untrained homeowners. The fiberglass facing has a rougher surface than paper facing, which some users don't notice until they have painted the wall and see an ugly bumpy texture that doesn't match the drywall throughout the rest of the house. Drywall guru Myron Ferguson comes to the rescue with practical tips: Either lightly sand the whole surface or apply a thin skim coat of joint compound. Ferguson also has a solution to the deepset screw problem. He suggests attaching the drywall to the framing with Liquid Nails or other adhesive before screwing it on. This allows for fewer additional fasteners and compensates for any overly deep screws. He also suggests leaving screws slightly protruding, then sinking them to the perfect "dimpled" depth by hand. Finally, Ferguson offers a final tip. If you are going to the extra effort to avoid mold-attracting paper on the drywall, paper tape between the drywall sheets will defeat that purpose. Instead, use fiberglass mesh tape. Paperless drywall might not be perfect, but it is a great idea for your bathrooms, kitchens and other moisture-prone areas. It offers better peace of mind that mold is not growing in your walls. 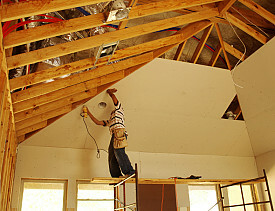 For expert drywall installation, contact a reliable contractor. Good Question: Can You Paint Over Wood Paneling?